We’ve finished sending out Kickstarter orders and the day has finally come. Wreck-A-Mecha is now available to purchase! Grab one copy for intense 2 player action or add a second copy for 4-player team battles. You can buy Wreck-A-Mecha on the game’s page or using the button below. 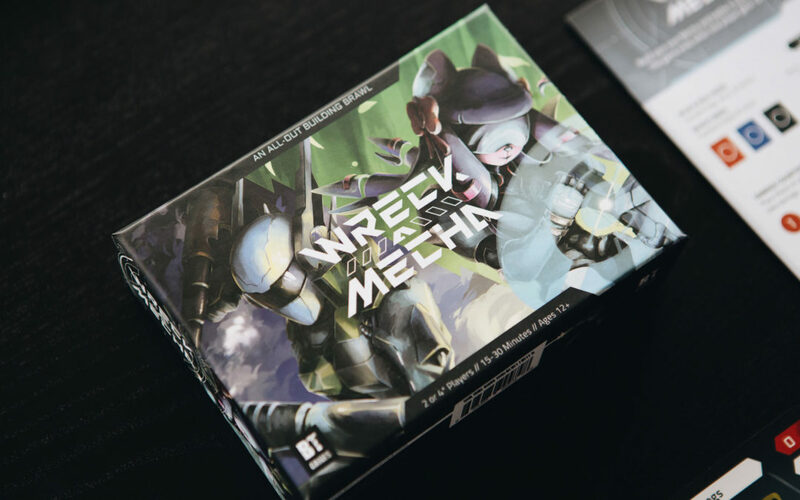 With designs taking inspiration from mecha anime and video games, Wreck-A-Mecha let’s you live out your mecha customization fantasies in a quick, 15-30 minute card game. In Wreck-A-Mecha players build a giant robot (mecha) from a randomly assigned head and core part along with arms and legs from their decks. Destroying opponent parts earns you victory points and the first to gain 10 points wins. Destroying the core will get you all 10 points, but it’s hard to hit. Players can use an arm to defend, forcing an attack to target it instead of anything else (until it is hit). Since you are only able to take 3 actions per turn, managing your offense and defense is key to survival. And with a weapon triangle causing weaknesses and resistances along with tons of unique special abilities for each part, you’ll need to install parts strategically to get the upper hand. Our 2017 Kickstarter pitch video below gives a good idea of what you can expect, despite featuring an older prototype.